Peel beets and carrot and cook in hot water until tender. Drain, dice, and chill the vegetables. 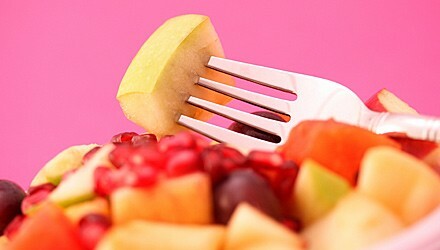 Meanwhile, chop fresh fruits as indicated and place in a large salad bowl. Stir in chilled diced beets and carrots. Whisk together lime juice, vegetable oil, sugar, and salt. Pour over salad and toss well. Sprinkle with peanuts and serve immediately. Exchanges per serving: 1 fruit, 1 fat. Carbohydrate choices: 1.